Whether it is for the protection of intellectual property or complying with government regulation, the immense potential cost of a data loss has made data loss prevention a critical part of network security. This webinar looks at recent compliance legislation and several high-profile cases that highlight the need for Data Loss Prevention (DLP) solutions, and asks tough questions about balancing the cost of data loss with the cost of non-compliance. 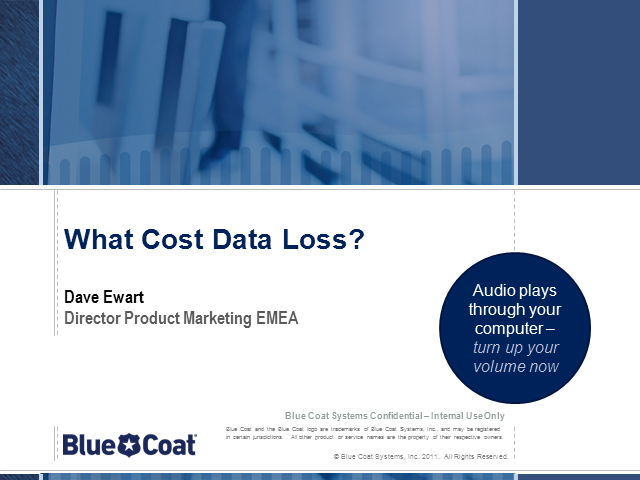 Focusing on recent Blue Coat advances, we provide guidance for companies concerned with data loss and solutions that overcome many of the cost of ownership barriers to adopting DLP. Neste webinar, aprendera como novas tecnologias de otimizaÃÂÃÂ§ÃÂÃÂ£o de WAN como "cloud caching" assimÃÂÃÂ©trica sÃÂÃÂ£o essenciais para melhorias significativas no desempenho de aplicativos baseados em nuvem. Vamos compartilhar o novo modelo para a implantaÃÂÃÂ§ÃÂÃÂ£o de aplicativos de gerenciamento de WAN sem a necessidade de um dispositivo no centro de dados em nuvem. En este webinar, aprenderÃ¡ cÃ³mo las nuevas tecnologÃ­as de optimizaciÃ³n como "cloud caching" asimÃ©tricos son fundamentales para lograr importantes mejoras en el rendimiento de aplicaciones basados en la nube. Vamos a compartir el nuevo modelo para la implementaciÃ³n de aplicaciones WAN de gestiÃ³n sin la necesidad de un artefacto en el centro de la nube de datos. Neste webinar vocÃª vai aprender a maximizar a proteÃ§Ã£o da rede com o sistema de defesa na nuvem em tempo real. TambÃ©m discutir como Software-as-a-Service de seguranÃ§a Web pode ajudar a relaÃ§Ã£o custo-eficÃ¡cia para proporcionar seguranÃ§a para os trabalhadores remotos e funcionÃ¡rios de filiais. En este webinar, usted aprenderÃ¡ a maximizar la protecciÃ³n de la red con el sistema de defensa basado en la nube en tiempo real. Tambien hablaremos de cÃ³mo Software-as-a-Service de seguridad Web pueden ayudarle de forma rentable a ofrecer seguridad para los trabajadores remotos y empleados de la sucursal. Web Security:What are My Options? Participe de este webinar y aprenda como prepararse para los desafios e Impacto del vídeo en la red corporativa. Oiga como clientes son capaces de ganar desempeño y reducir su dependencia del ancho de banda. Durante este webinar vamos analisar as conclusões do relatório de segurança da Blue Coat publicado em agosto. As the demand for greater application mobility and security grows in the distributed enterprise, new strategies are required to secure and optimize web content, video and mission-critical applications. This educational webinar series focuses on Web Security and Wan Optimization topics related to mitigating evolving web security threats, managing network contention, assuring application performance and containing cost and complexity. Durante este webinar estaremos revisando los hallazgos del reporte de seguridad de Blue Coat publicado en Agosto. Explosive demand from end-users for rich Web 2.0 content, especially videos and large files, is creating significant challenges for Service Providers and organizations delivering Internet access to large numbers of users. The challenge is how to deliver all of this rich bandwidth-hungry content, while containing network costs and still delivering a high quality end-user experience. This webinar will discuss the next generation of caching -- including what has changed with Web 2.0, what techniques are required to effectively cache this large and dynamic content, plus the benefits customers -- like you -- are realizing for saving on bandwidth and speeding web downloads. The webinar will also include an exclusive, invite-only preview of the newest Blue Coat CacheFlow 5000 appliance, as well as technical details on the product and underlying caching technologies like CachePulse(TM) uniquely available in this new release. Como previnir as ameaças de segurança nas Redes Sociais. Das Warten hat ein Ende: Erfahren Sie, wie WAN-Beschleunigung der nächsten Generation zur Mitarbeiter-Zufriedenheit beitragen kann. 40% of enterprises report they have been compromised through social networking sites. Real-time multi-layered threat protection has become an art form and requires new deployment models. It’s time to explore the value of a hybrid approach, combining on-premise and cloud-based Web security for the best of both worlds. How can you adequately protect your business from the growing risks associated with Web 2.0 and social media? Are you considering Web protection for remote employee access? Is an enterprise hybrid deployment model best for you? What should you look for in an integrated Web security and endpoint AV solution? Get answers to these questions and much more. Title: What Cost Data Loss?